Like anywhere in Northland, there are countless beautiful beaches along the Bay of Islands. Some inviting to swim, snorkel and relax with golden sand, others providing hours of fun for old and young finding rock pebbles, shells and other curious items. Here are our top picks that you won’t want to miss when in the area. The Bay of Islands is known as a coastal paradise. When it comes to beaches you are really spoilt for choice. Whether you have a car, campervan, boat or kayak, you are bound to find the perfect spot that suits your needs. You can drive along the coast or head out to one of more than 140 islands that make up the Bay of Islands and experience pristine crystal clear water, white sandy beaches, swim with dolphins or go snorkelling, fishing and explore hidden caves and inlets. Paihia, also known as the “Jewel of the Bay of Islands” is bound to have a beach to go with its busy vibe. Indeed, the town’s main beach stretches all along the waterfront and in summer invites hundreds of visitors daily to relax, swim and sunbathe. It’s popular with old and young due to its calm waters, its proximity to shops and restaurants, public toilets and the huge range of day trips, cruises and hikes through nearby bush and coastline. Paihia is easily accessible by car and bus, situated right along State Highway 11. There is plenty of parking all through town and it’s only a short walk to the beach. You can throw your towel down into the sand or onto the grass and dip into the water for a swim, grab an ice-cream or a drink to cool you down and spend the afternoon browsing through the numerous shops nearby to get some souvenirs for loved ones before deciding which restaurant to choose for dinner. If you don’t mind the hustle and bustle of a town filled with people from all over the world, then Paihia is definitely the beach for you. It’s child-friendly and offers something for all ages and interests. Just north of Paihia, closer to Waitangi, is Te Tii Beach which is extremely popular with swimmers and fishermen. 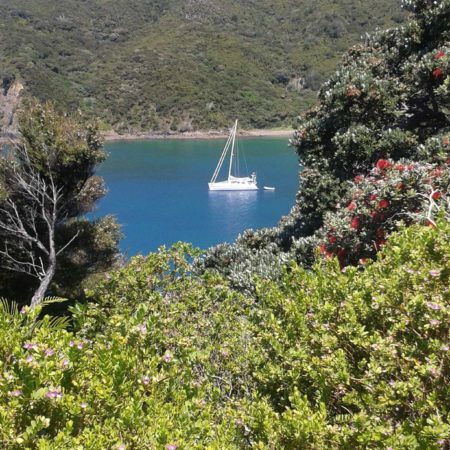 The best time to visit is summer, when the native Pohutukawa trees are blooming, painting a breathtaking scenery of dark red. Te Tii is slightly bigger than Paihia and covered with beautiful white sand. Apart from swimming you can hire a rod and reel and try your luck at catching some fish for tea, or grab a jet ski or kayak and explore the coastline a bit further. Again, there is plenty of parking nearby and it’s only a 15 minute walk back to Paihia. Across from Paihia, on the Russell side, is Oneroa Bay which literally means Long Beach. It’s accessible via a pleasant 20 minute walk over Flagstaff Hill or via a short car drive. Oneroa is considered a safe family beach for swimming and kayaking and is also popular for boating, sunbathing and walks. Animal lovers will want to visit the nearby shag colony and dolphins are known to frequently visit these waters. The first holiday baches along this one kilometre long stretch of white sand were build in the 1920s and its popularity increased even more after World War II. Parts of the beach are accessible for dogs if kept on a leash, and there are public toilets at the northwest end. This beach does not have any nearby shops, but it’s a perfect spot for a picnic on the beach so grab a basket and some food and enjoy the scenery and the view across the islands to Cape Brett peninsula. Just around the corner is Donkey Bay which has been popular in the past for naturists. It’s a rather secluded beach but worth a visit if you are prepared for the views. Kerikeri is mostly known for its numerous orchards and fruit plantations. However, there are a few beautiful beaches hidden in the area, which are less known among tourists and therefore less busy. Opito Bay is one of the most scenic ones, situated on the northern side of the Kerikeri river inlet. It’s a typical Kiwi seaside settlement with traditional baches, a boat ramp and white sand. There are no shops, but lots of free parking and public toilets. It’s a popular destination to launch your “tinny” (little aluminium boat) or go for a kayak adventure around the bay. For those that prefer more peace and quiet, this island is the place to go. Urupukapuka Island is the largest island in the Bay of Islands and only accessible via boat or ferry. Several tour operators offer day cruises or return journeys to the island, where you can access several white sandy beaches as well as undertake short walks that allow magnificent views over the bay. Urupukaka is a pest-free recreation reserve and as such also offers bird lovers a true paradise. Spot native species such as saddlebacks and robins as well as other sea birds. There are several campsites for those that are wanting to stay and enjoy the pristine island life for longer. Grab your tent and take your time to explore well-preserved archaeological remnants of early Māori settlements or snorkel, kayak and fish around the bay. There is also a licenced bar and café at Otehei Bay serving food and drink. Probably one of the most stunning beaches in the entire country, Oke Bay is considered even a favourite with global opera star Kiri Te Kanawa who owns a holiday home nearby. The beach is situated in a secluded part of the Cape Brett peninsula and also forms the start of the day long track leading to the lighthouse. To get there, simply follow the signs toward Rawhiti, it’s about 29 kilometres from Russell. From the settlement it’s a short hike over the hill down into the bay which is a beautiful tranquil spot for swimming and relaxing. Dolphins are often spotted here and if you’re fast (and brave) enough you might be able to enjoy a swim with them. Oke Bay is also popular with couples who want to get off the beaten track and enjoy a few romantic hours, watching and walking together into the sunset.